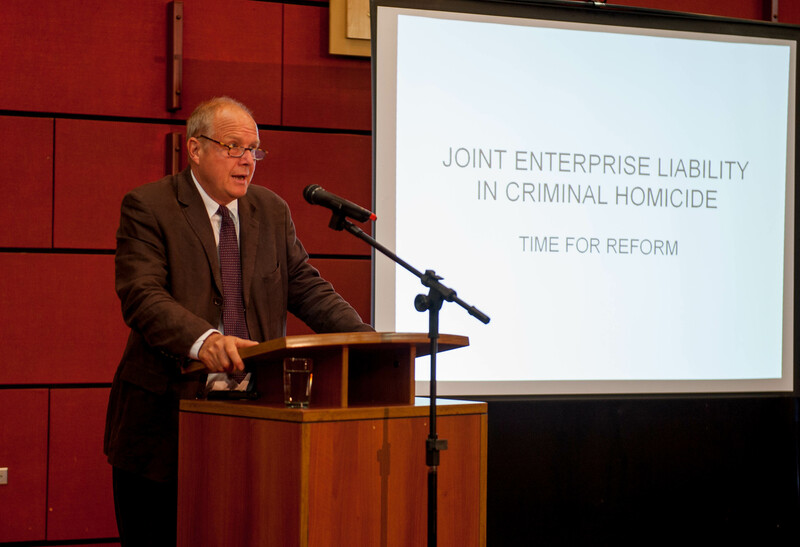 Professor Wilson addressed the audience saying that, particularly in the case of murder, there is a significant injustice arising out of Joint Enterprise Liability because a conviction for being party to a joint enterprise means that a person suffers all the consequences of a murder conviction, including the offence label and the mandatory sentence – life imprisonment in the UK, death penalty in Trinidad and Tobago – without having laid a finger on anyone and without intending anyone any harm. He said that manslaughter, not murder, would be the more appropriate label and that amending Joint Enterprise Liability would not only make the criminal justice system “more just”, it would also save a lot of money and simplify things in the current trial system. “At the moment, the way things work, too many people are charged under the Joint Enterprise Liability rules wrongly. It involves appeals and very, very difficult case management, and I think that is something which the criminal justice system could do without,” said Wilson. In light of the UK Justice Select Committee report (December 2014) calling for urgent reform of joint enterprise liability, he argued for the clear need for reform and in his opinion, “the most suitable mechanism is via the courts” because legislative reform in the UK would depend on a Bill being slotted into “an overcrowded and heavily political legislative timetable.” “However the signs are that the Supreme Court is not amenable,” Wilson explained, “due to the number of appeals that will be unleashed. It is for this reason that I am banking on the Privy Council.” He said the impetus to get the court to reform Joint Enterprise Liability could come from Trinidad and Tobago, since “any realistic likelihood” of getting the law changed would require somebody successfully appealing a case all the way to the Privy Council. 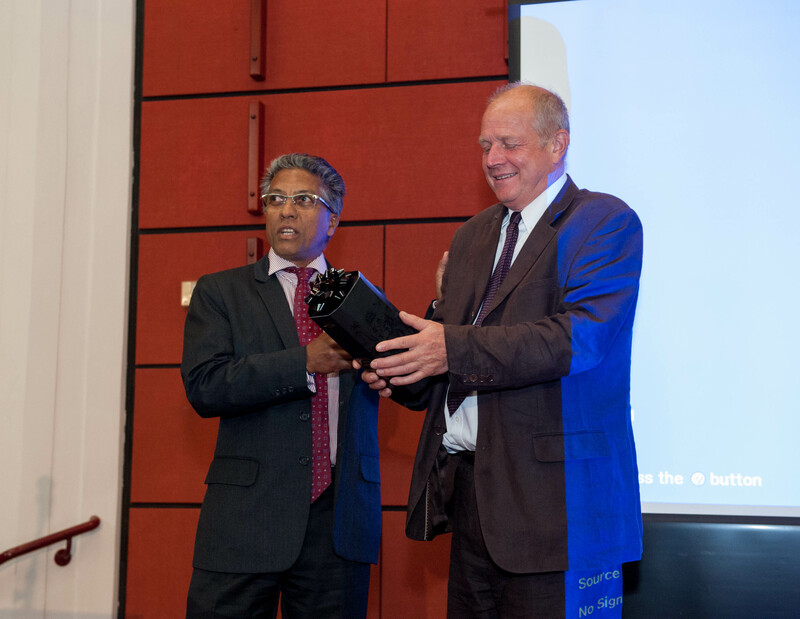 Professor Wilson receiving a presentation from the President of the Law Association, Reginald Armour SC. This lecture, hosted in collaboration with the Law Association of Trinidad and Tobago, the Hugh Wooding Law School, the Trinidad and Tobago Criminal Bar Association, and the British Caribbean Chamber of Commerce, was attended by over 300 guests including prominent members of the legal community, students and alumni of the University of London International Programmes. Dignitaries who attended the event included the Acting Chief Justice of Trinidad and Tobago, Judges of the Supreme Court of Trinidad and Tobago and of the Caribbean Court of Justice, Magistrates, the Director of Public Prosecutions, President, Vice President and members of the Executive of the Law Association of T&T, Vice President of the Criminal Bar Association, and the Principal of the Hugh Wooding Law School. The suggested proposals by sir Wilson have been read by myself with a critical perception. His proposals are very consistent with the current law and the proposed reforms in the UK. from what I’ve gathered with my readings and understanding, I share the same opinion as himself. In addition, the best committee who can actually aid in this urgent amendment is the Privy council… after all we speak of justice and in all countries people are inquiring about fairness. Thus, I will add to what he has come up with and agree with his proposals. We can see that his reasoning of the proposals are sound enough to add to the requirement for urgent reform. In line with that, we also need to bear in mind the appearance theory which was highlighted by the Privy Council Committee themselves… people need to see that judges are in accordance with laws established by Parliament.. they are upholding justice and fairness, no matter the country and their culture.